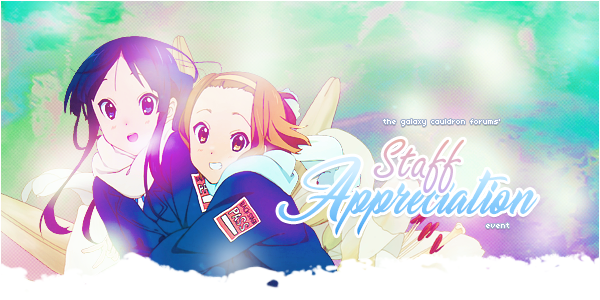 ~THANK YOU STAFF!~ Staff Appreciation Day! We can't say thank you enough for being with us on our fandom journey. (Without you, GC simply doesn't exist!) Sailor Moon is such a teeny, tiny part of the big, giant internet, and knowing that passionate fans like you are interested in keeping the fandom alive is a truly beautiful thing. From livestreams, to clubs, to all the work you do behind the scenes, we want to say thanks! We really do appreciate everything you do to keep GC going! Thank you Staff! I'm so happy to have finally met several of you IRL!! Also, special thank you to Diagnosed for getting livestreams up and going and planning them with me! Thanks to all the staff for making GC such a wonderful place! I'm glad I was able to join this little community! All you staff do a great job at maintaining this site and keeping it a drama-free, comfortable place to discuss Sailor Moon. Here's to you. Thank you to each and every Staff member EVER! X Infinity!!!! you all are awesome and do awesome things on a daily basis!! Excellent work to you all! May these forums continue to be the fun place they are for Sailor Moon stuff, and thanks to the staff and moderators keeping it running! Thanks to all the staff for your awesome job here, in the sailor moon world ! HAPPY BELATED STAFF APPRECIATION DAY, GUYS!!! It's been such a great and interesting experience working with each and every one of you! I truly wish we could all be doing this for a living and spend 9-5 together haha. And for those that I still haven't worked with much yet, know that I definitely still appreciate you guys and what you do - both Mods and Admin alike!! I hope all the other Staff were able to take a moment yesterday to sit back, forget about all the dreams and to-dos ahead for a sec and just realize how much you all have DONE already and how your efforts (big and small!) *matter* in shaping this place. Sorry this is late btw. I wanted to say something yesterday but I was too busy scrambling to catch up amidst RL stuff ^^;. Better late than never lol. Thank you all so much for creating such a lovely place for us to spend time and get to know one another! Thank you for everything you do, staff! It's a lot of work to keep this site nice and tidy-with a full-functioning and sparkly layout at that! You guys are like a finely tuned oil machine! Other forums wished they had a team that works so efficiently and well together! Cheers to you guys! You deserve it! Thanks everyone for your hard work <3 and for helping us keeping the activities and all the fun around here! Yaaaay staff!!! Thank y'all for everything!!! !